The West of Broad side of South Street is recently replete with tons of restaurants. Sit-down, takeout, PIE, it’s all quite the transformation. 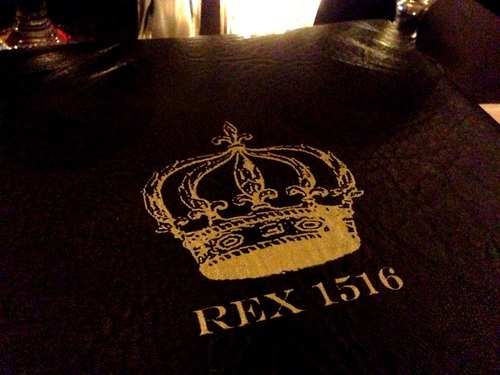 One of these newer spots is adorable Rex 1516. It’s so cute and moody, and rather romantic looking. It’s southern-inspired cuisine, and there are plenty of homecooked style dishes on the menu. I’m a sucker for mac n cheese, so of course I had to get it! Rex’s version contains gruyere, fontina, swiss, roasted tomatoes, and is topped with crispy ham. 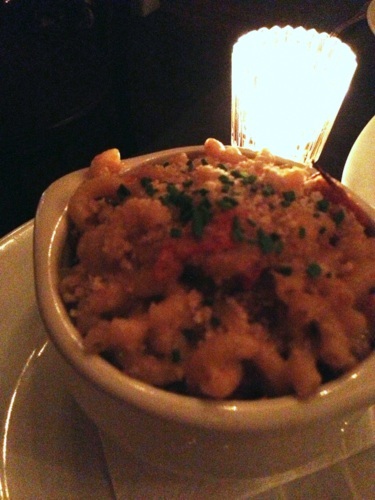 It’s not an ooey gooey type of mac n cheese, which isn’t a bad thing. Sometimes I find those types too rich. It’s just cheesy enough, and the ham was a nice surprise. 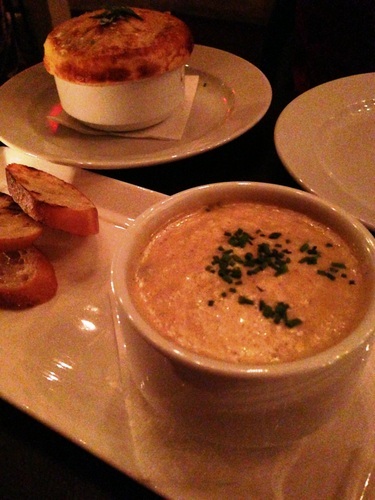 We continued with a couple of more small plates, including the Crawfish Pot-Pie and the soup of the day. The pot-pie contained a 3 cheese spicy crawfish etouffee in a golden pie crust. The soup was a potato-based mushroom soup, which had a little kick. We were afraid that it would have too much of a mushroom taste, but it was actually pretty potato-heavy and yummy. 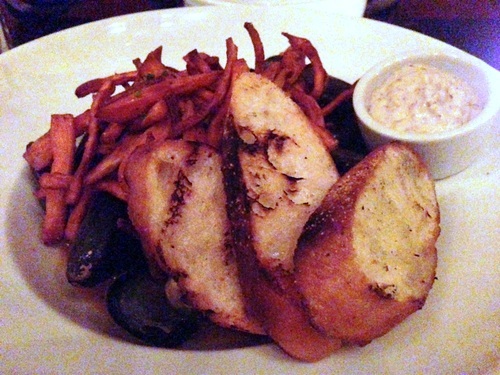 Lastly we shared the Moules Frites – a big plate of PEI mussels, sweet potato fries, bacon, roasted tomatoes, and thyme, in a Dijon-porter broth. This was a great way to end the meal, as the small plates had certainly got us started, but we didn’t need our own entrees. As a fan of sweet potato fries, in general, I’m happy to report that these are some of the best in the city! The mussels and the broth worked really well together, and we both enjoyed these immensely. We had a great time here, and the service was attentive and friendly. The atmosphere is low-lit and romantic and they play excellent music! 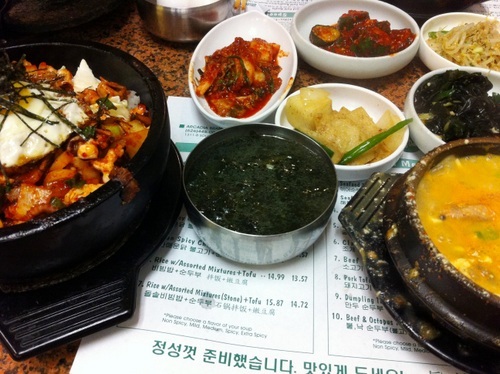 For my last night in LA, we took a short drive to Arcadia for some soondubu. 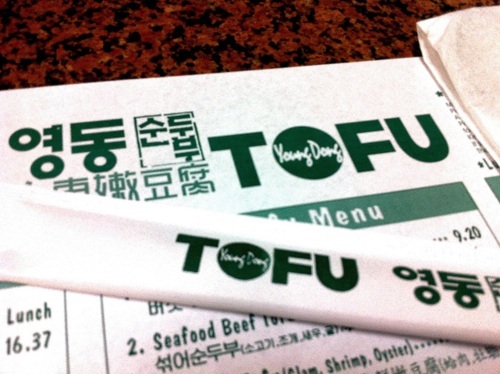 Man alive, what I’ve realized about soondubu joints is that there is so much food. And you can never eat it all. And you will leave the place feeling like you’re going to explode. Here’s the banchan that we got, which included a really nice variety of stuff. My favorite was the cucumber kimchi. My friend S asked me why I kept eating it. Because it’s freakin delicious! She was eating the regular kimchi, which I didn’t care too much for. There were raw oysters in it and it was too oystery for me. So I asked her why she kept eating the regular kimchi. Because of the oysters! To each his own kimchi! We each ordered our own soondubu, seafood for me and oyster for S (there’s S with the oysters again), which is so much food that we could have just shared one, but we also ordered a stir-fried octopus rice dish, because we’re crazy. What were we thinking? Like I said, so much food! And it felt like it just kept coming and coming and coming! They also gave us seaweed soup with the octopus. Needless to say, there were lots of leftovers for S to take home, possibly several times over. Everything tasted good and we had a great time. Service was friendly and attentive. I had a business trip to southern california and stayed in the Burbank area. This area isn’t necessarily a mecca for awesome food (unless you’re talking about In-N-Out Burger!). Before meeting up with a friend to hike in Griffith Park, I stopped at a random sushi spot for a quick bite. Except when I got there, it wasn’t opened yet. What am I, a thousand years old, getting there for the early bird special? I putzed around CVS for awhile, until they opened, then became the lone diner there. It’s a little spot in an extremely nondescript stripmall. 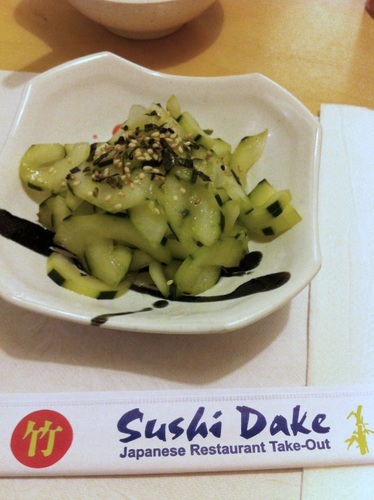 I started with the cucumber sunomono because I love me some cucumbers, and wanted something zingy. I devoured this instantly. I even got sushi this time! I ended up getting the udon sushi, which is udon along with 4 pieces of mystery sushi. 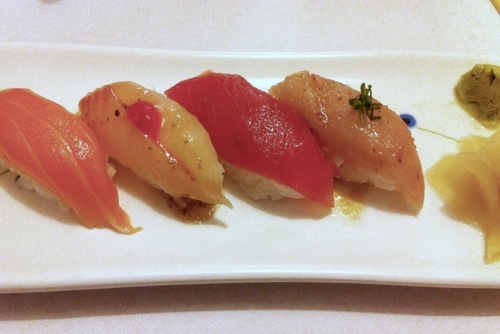 You can’t pick what you get, so it’s pretty much sushi chef’s choice. I loved every piece. Aside from the obvious salmon and tuna, I had no idea what the other two pieces were. But one came with a dollop of sriracha and the other had a sesame/soy based sauce on top. They were all fresh and delicious. 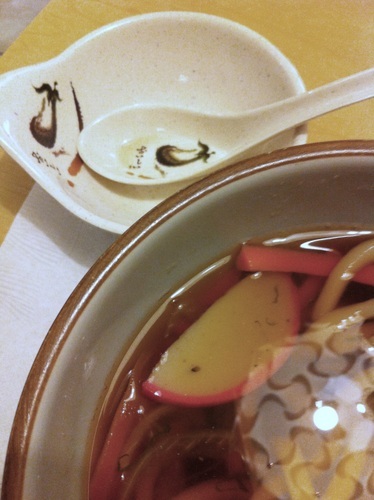 I pretty much always get udon when I can, and I also got it here. But this time, it was really a necessity as it was pretty damn cold in LA! I expected warmth and sun, but instead, I got cold and clouds. So the soup did a good job of filling my belly and warming me up. Since I was literally the only diner there, service was quite attentive. I enjoyed my meal and then had a lovely hike.